Daniel is an award-winning holistic therapist, yoga teacher and mindfulness trainer who has been working with children for over 10 years. He holds a Master’s Degree as a Dance Movement Psychotherapist from Goldsmiths, University of London, as well as a Bachelor’s Degree in Philosophy from the Javeriana University in Colombia. Apart from his professional work as a therapist, he volunteers for the global meditation project Peace Revolution. 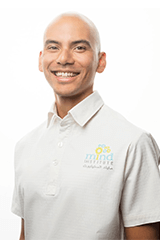 Daniel integrates movement and music therapy to help children unleash their creative potential. He has taught workshops on mental health and holistic wellness to a wide range of audiences in Latin America, South-East Asia and Europe. Daniel is passionate about supporting special needs children by creating a safe space where they can find their own voice. His work has been featured in Qatar Tribune and The Gulf Times, and his online guided meditations have reached over 20K people around the world. You can find out more about Daniel via his website: https://daniel-matallana.com/.